Often called “Paris of the Middle East”, Beirut is a thriving hotspot for shopping, socializing and sightseeing, despite many wars and unrest. The city has been rebuilt several times, with modern architecture sharing space with Ottoman and colonial French buildings. Bustling streets such as Hamra and Ashrafieh provide hopping nightlife while the National Museum and the Gibran Museum give visitors a taste of the city’s history. 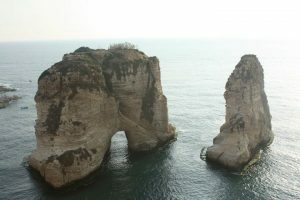 The Corniche is the place for activities like jogging and biking as well as great views of the Mediterranean, Mount Lebanon and Pigeons’ Rock. 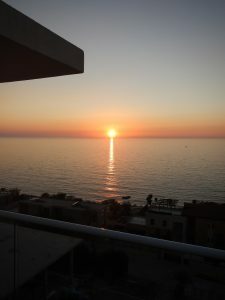 Although the name Beirut sometimes conjures up images of unrest and discontent, this Capital of Lebanon now enjoys a peaceful existence amongst its varied ethnic inhabitants. It is the largest city in Lebanon and one of the oldest cities in the world, inhabited more than 5,000 years ago. Excavations in the downtown area have unearthed layers of Phoenician, Hellenistic, Roman, Byzantine, Arab, Crusader and Ottoman remains. Two other cities in Lebanon also rank amongst the oldest in the world; Sidon at 6,000 and Byblos at 7,000 years (5,000 B.C.). Settled initially by the Phoenicians it was conquered by Pompey in 64 B.C. and was assimilated into the Roman Empire. Beirut was considered the most Roman city in the eastern provinces of the Roman Empire. Beirut passed into Arab control in 635 and Prince Arslan bin al-Mundhir founded the Principality of Sin-el-Fil in 759 AD. This later developed into the Principality of Mount Lebanon, which was the basis for the establishment of Greater Lebanon, today’s Lebanon. Under the Ottoman sultan Selim I (1512–1520), the Ottomans conquered Syria including present-day Lebanon. Beirut was controlled by local Druze emirs throughout the Ottoman period. After the collapse of the Ottoman Empire following World War I, Beirut, along with the rest of Lebanon, was placed under the French Mandate. Lebanon achieved independence in 1943, and Beirut became the capital city. This era of relative prosperity ended in 1975 when the Lebanese Civil War broke out throughout the country. During most of the war, Beirut was divided between the Muslim west part and the Christian east. In 1989, the Ta’if Agreement was designed to end the decades-long Lebanese Civil War, reassert Lebanese authority in Southern Lebanon (then occupied by Israel). It was signed on 22 October 1989 and ratified by the Lebanese parliament on 5 November 1989. By the summer of 1992, the first parliamentary elections in 20 years took place. Following the destructive Lebanese Civil War, Beirut’s cultural landscape underwent major reconstruction. The reconstruction of downtown Beirut has been largely driven by Solidere, a development company established in 1994 by Prime Minister Rafic Hariri. Unfortunately, there are still areas in Lebanon that still harbour discontent and sporadic fighting can break out in selected areas. Please check up-to-date travel advisories from your country to ensure that you are aware of these. Most restrictions are within Hezbollah-controlled areas of south Beirut, south Lebanon near the Israeli border and northern parts of the Beqaa Valley. Religious groups in Lebanon comprise about 55% Islam, 40% Christian and 6% Druze. The Lebanese Christians are some of the oldest Christians in the world. South Lebanon, southern Beirut and areas North East of Lebanon are considered Hezbollah strongholds. Lebanon’s Hezbollah organization is a Shi’a Islamist militant group and a political party, although many countries do not recognize their political status and consider them a terrorist organization. Much fighting between Hezbollah groups in South Lebanon and Israel has been waged over the years and Hezbollah have been described as a “state within a state”. Beirut, due to its geographic setting, offers some great breathtaking vistas. Sitting on a peninsular extending westward into the Mediterranean Sea, the city has coastlines facing south, west and north. Flanked by the Lebanese Mountains to the east, much of the city is built on the slopes providing spectacular views of the city and Mediterranean. Lebanon is not a large country, measuring 217 km NE-SW and 56 km SE-NW. with an area of 10,400 sq. km. The climate varies from a Mediterranean-type subtropical climate along the coast and in the Bekaa Valley to a generally cool one in the upper mountains. Summers are hot and dry; winters are mild and humid. Frost is rare at lower elevations. The mean temperature in the lowlands is 26.7° C (80° F) in summer and 10° C (50° F) in winter. The mountainous region is somewhat cooler. 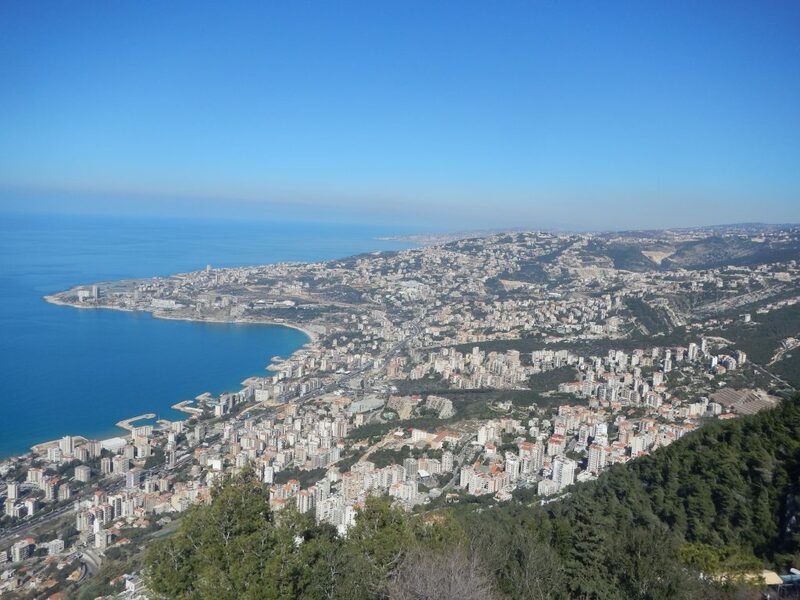 Driving in Lebanon can be a challenge for tourists, so take heed if you intend to rent a car. Although there appears to be a lack of order, drivers are far more courteous than you see in North America. Although there are some idiots on the road, for the most part their driving habits have evolved into one that allows maximum movement of vehicles. Due to the high traffic volumes, when vehicles bunch up, the notion of ‘lanes’ is forgotten and you will see three of four rows of vehicles on a two-lane road and five or six on a three-lane. Integration of traffic is sensible and you nudge your way into the traffic and someone lets you in. Disrupt the courtesy and you will be subjected to an angry horn. One of our first visits was to the Shrine of our Lady of Lebanon. The shrine belongs to the Maronite Patriarchate who entrusted its administration to the Congregation of Maronite Lebanese Missionaries since its foundation in 1904. It is one of the most important shrines in the world honoring Mary, Mother of Jesus. The shrine is highlighted by a huge, 15-ton bronze statue. 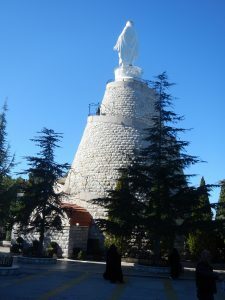 The Statue of Our Lady of Lebanon is a French-made, 13-ton statue, made of bronze and painted white, of the Virgin Mary. It was erected in 1907 on top of a hill, 650 meters above sea level. 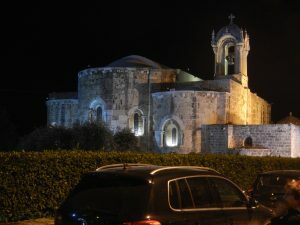 There are churches, schools and shrines dedicated to Our Lady of Lebanon in many countries of the world. A place to put on your agenda while in Lebanon is the ancient city of Byblos. Here you will experience the integration of modern facilities with historic buildings in this UNESCO World Heritage Site. The city is known for its fish restaurants, open-air bars, and outdoor cafes where a variety of ethnic foods are served. We sampled an interesting meal whereby clay ‘barbeque’ pots were placed on the table and you grilled the array of vegetables and meat on the metal grill. More of a novelty in my opinion than a practical way to eat a meal. 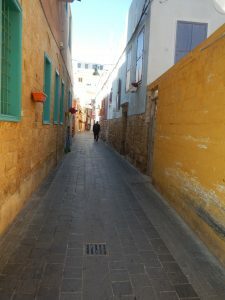 A stroll through the historic quarter by either day or night is an interesting and recommended activity. Wander through the narrow streets and take in the historic buildings that are alive with either restaurants or merchants offering their wares. Of interest is the St. John-Marc Cathedral where the church started during the Crusades in 1116. It was considered a cathedral and was partially destroyed during an earthquake in 1176 AD. When Islamic forces captured the city, it was transformed into a set of stables. It was later given to the Maronites as a gift by Prince Youssef Chehab of Lebanon in the mid-1700s, after they aided him in capturing the city. As mentioned, Lebanon has some of the oldest cities in the world, and Tyre, (or Tyr) situated on the coast about 80 km (50 mi) south of Beirut comes close at 4,750 years of continuous habitation. The name of the city means “rock” after the rocky formation on which the town was originally built. The adjective for Tyre is Tyrian, and the inhabitants are Tyrians (I think I saw that on Star Trek one time…). Originally, Tyre was actually an island and Alexander the Great created a causeway connecting it to the mainland city of Ushu during his siege of the city. It is said that Alexander was so enraged at the Tyrians defense and the loss of his men that he destroyed half the city. The original causeway has subsequently been expanded over the years to what now is an isthmus jutting out into the Mediterranean, much like Beirut. You can also visit Roman ruins in Tyre, a testament of its historical significance. Tyre’s seaport is still much as it was during those early times, with the exception of the addition or extension of a sea wall to protect the harbour. 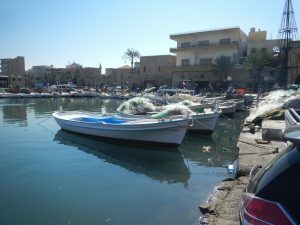 It is still used as a fishing port and the traditional boats can be seen in the harbour and nets aligned on the shore. While there, we had an excellent meal at the Le Phencien Sea Food Restaurant. Prior to your meal, the tradition is to select your main course from the array of fresh-caught (that morning) fish. We chose a sea bass as the main fish along with some smaller ones to be used as appetizers. The meal started with the traditional salads and appetizers, followed by the butterflied sea bass. I find that many people tend to overcook fish, but this was cooked to perfection as our party of six dug into its scrumptious white flesh. Along with some wine, we were treated to one of the traditional Lebanese drinks, Arak, an anise-based alcoholic spirit mixed in the usual portions of ⅓ Arak to ⅔ water. An important and influential person in the history of the Lebanese Maronite Christians is Youseff Antoun Makhlouf. In 1851, Youssef left his family and entered the Lebanese Maronite Order at the Monastery of Our Lady in Mayfouq to begin his training as a monk, later transferring to the Monastery of St. Maron in Annaya, located in the Jbeil District near Beirut. Here he received the religious habit of a monk and took the name Charbel, after a Christian martyr in Antioch from the 2nd century. He made his final religious profession in the Order on November 1, 1853. 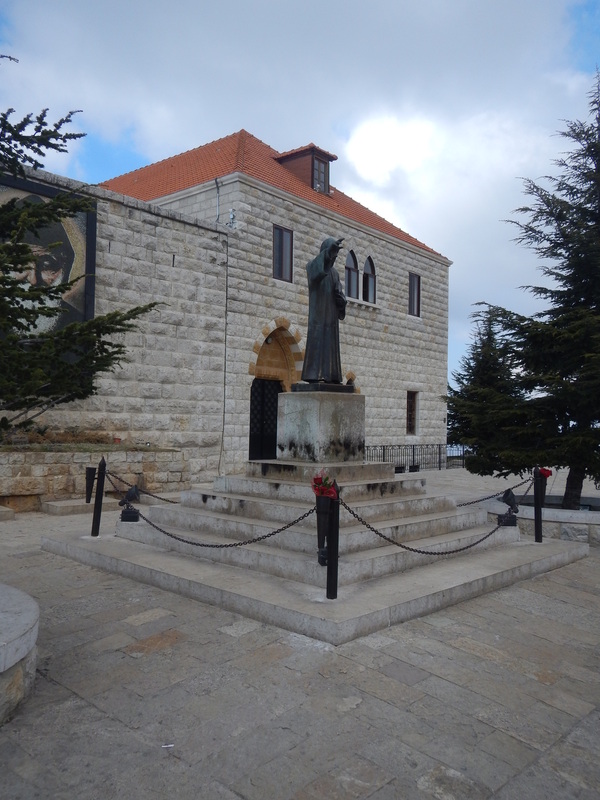 Charbel is known for stories of miracles surrounding him during his life and a great number of miracles have been attributed to him since his death. The most famous one is that of Nohad El Shami, a 55-year-old woman at the time of the miracle who was healed from a partial paralysis. In 1875, Charbel was granted by the abbot of the monastery the privilege of living as a hermit at the Hermitage of Saints Peter and Paul, a chapel under the care of the monastery. He spent the next 23 years living as a solitary hermit, until his death from a stroke on December 24, 1898. 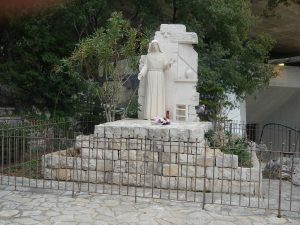 Another important and noteworthy saint of the Maronite Order is Rafqa Piertra Choboq Ar-Rayès, known as Saint Rafka or Saint Rebecca. According to the story, Rafka had prayed to God asking why she had never suffered any sickness and if He had abandoned her. Apparently, the next day, she suffered searing pain in her eyes and eventually had to have one removed, refusing any anesthetic during the process. Eventually, the other eye sunk in its socket and she went blind, but she never complained of the pain because she had asked God for it. For about 30 years, both sockets hemorrhaged two to three times a week, yet she continued to spin wool and cotton and knitted stockings for the other sisters. Three days before her death, Rafqa said, “I am not afraid of death which I have waited for a long time. God will let me live through my death.” Then on March 23, 1914, four minutes after receiving final absolution and the plenary indulgence, she died. Lebanese people are foodies! We enjoyed some great Lebanese food while vacationing there. Most often foods are grilled, baked or sautéed in olive oil; butter or cream is rarely used other than in a few desserts. Vegetables are often eaten raw, pickled, or cooked. Herbs and spices are used frequently and in large quantities. Like most Mediterranean countries, much of what the Lebanese eat is dictated by the seasons and what is available. Lebanese cuisine also varies by region. From the traditional Hummus, Fattoush salad, Baba ghanoush, Falafel and Tabbouleh that we generally see in our local Lebanese restaurants, there are many more, lesser known dishes that are available. 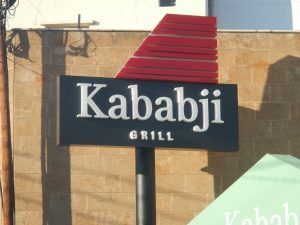 We sampled an excellent lunch at the Kababji Grill while in Byblos. Tradition is that one orders a mixed sampling of salads, such as, Tabbouleh and Fatoush, followed by appetizers to include Hummus and Moutabal Eggplant, then a main course that could consist of Kaba Chicken, Kebbeh or Lamb Cutlets. No matter what you choose, all the offerings are delicious. If you have room for desert, you can opt for the traditional Baklava or one of a variety of Lebanese deserts. Lebanon has a thriving wine industry and has the climate to grow a large variety of grapes. Whereas most of the top wineries are in the Beqaa Valley, due to wars and the unstable economic and political conditions Lebanon faced in the past, with difficulties some farmers still face today, many previous inhabitants of the valley left for coastal cities in Lebanon or emigrated from the country altogether, with the majority residing in the Americas or Australia. We visited the IXSIR winery located in Basbina and has the distinction of being awarded the Green Good Design in 2011 from CNN. The wines of IXSIR blend rich varieties of grapes cultivated from carefully selected terroirs that symbolize the diversity of Lebanon. Spread from Batroun in the North, to Jezzine in the South, and the hillsides of the Bekaa Valley in the East, these selectively chosen vineyards embody the best terroirs the country has to offer. 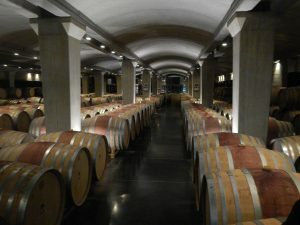 Wine tours of this modern facility are scheduled daily from Tuesday to Sunday with sampling of their many wines in their winery boutique. Plan to have lunch in their excellent restaurant, ‘Nicholas Audi à La Maison d’IXSIR’, where you can enjoy a la carte food Tuesday to Friday and a buffet Saturday and Sunday. One of the things that has become more and more popular in North America (and even in resort areas of Mexico) is brewed decaffeinated coffee. My wife and I each suffer from different side effects of caffeine and drink decaf. coffee all the time. Not in Lebanon! The only decaffeinated coffee available there is packeted powder that you add to a cup of hot water…yuck! Even in Starbucks and Second Cup outlets, there is no brewed decaf. available. We stayed in a resort about 20 km north of Beirut called the Whitelace Resort. Although the facility had some excellent attributes (modern building, pool and ocean view) it lacked internal fit-up of items normally expected in a hotel. However, it is referred to as a ‘chalet’ and most guests rent for long periods of time, primarily as a summer resort, and bring their own things. There was no bedside table or lamps, no dishes or cutlery (even though it had a fridge and burner), no drawers to put clothes and nowhere to put anything next to the pedestal sink in the bathroom. We had decided to check out and find alternate accommodation, but the management asked that we give them a chance to provide the things necessary. I must admit that they did an excellent job of doing so and we stayed for the duration of our 6-day trip. We had originally booked two rooms for the two couples traveling – one was a small studio and one a larger unit that we planned to use to entertain. Not only did they upgrade the smaller room to a larger studio, they upgraded the original larger studio to a 2-storey penthouse unit that served well for the entertaining. They also provided breakfast each day. In general, I would recommend a trip to Lebanon and experience its rich culture, friendly people and geographic beauty. Unfortunately, we were there for only six days but, because we had the advantage of having Lebanese traveling companions, we were able to see maybe more than regular tourists would. Whereas winter months can be a little cooler, the resort areas and attractions are less busy. During the summer, expect difficulty in finding accommodation and very busy times at attractions.